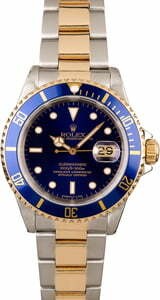 If it's a mid-level Rolex Submariner that you seek, we recommend the steel and gold reference 16613. Crafted from stainless steel and 18 karat yellow gold, the ref. 16613 will make a luxurious statement without breaking the bank. What's more, is the two-tone finish is paired with a striking blue dial and bezel with gold accents. 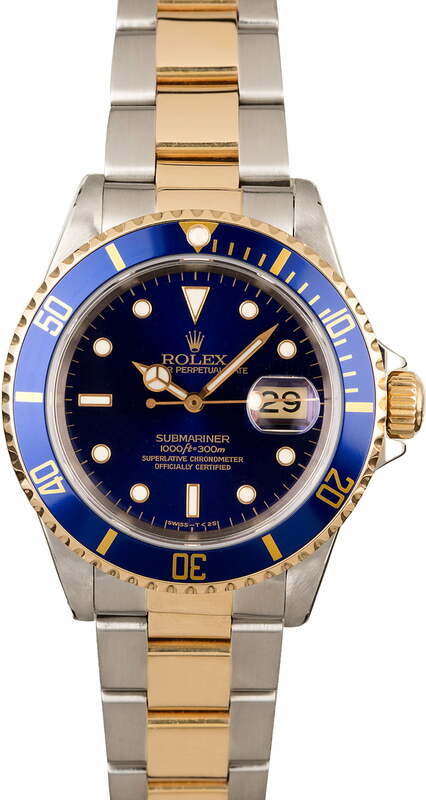 While the Submariner offers exceptional style, it was originally developed by Rolex as a tool watch for professional divers. This means that the case is equipped with a unidirectional time-lapse bezel, a scratch-resistant sapphire crystal, and a waterproof screw-down crown that can withstand depths of up to 1,000 feet. A flat-link Oyster bracelet and folding Oysterlock clasp accompany the case, creating the perfect balance to the 40mm Oyster case.